In the chapter on L’Heure d’été (Summer Hours, 2008) in this collection on the work of Olivier Assayas, Geoffrey O’Brien describes the film as a story about the “transmission of objects” and the memories associated with them. In this story about packing up and dealing with the objects of a house and a life following a death, the tangibility and stability of the objects throws into relief the instability of the memories, which persist in living minds as “a fragment of a fragment of a fragment” (189). It is a minor way into this collection, but this description resonated precisely for me with the experience of the book itself, which is a stocky and satisfying object – full of evocative images and descriptions of Assayas’s films that capture – momentarily – the way that they always exist in my mind as a collection of slippery moments: of images, sounds and effects that cohere beautifully in their viewing, only to break away into their disparate parts immediately afterwards. In a unique and precise way, this book encourages immersion in the same way that Assayas’s films do. Published by the Austrian Film Museum alongside Adrian Martin’s English translation of Assayas’s 2002 memoir A Post-May Adolescence: Letter to Alice Debord and the 2012 film Après-Mai (Something In the Air), Kent Jones’s edited collection is the first sustained critical work to attend to this important director. Assayas is a key figure in the contemporary landscape of global art cinema, with direct connections to the Nouvelle Vague through his work at Cahiers du cinéma in the 1980s, but a complex relationship to the politics of the movement, and especially its attack on tradition and romanticism. The situation is described well in Jones’s introductory essay where he recounts something Assayas told him in 1997: “the whole generation of the Nouvelle Vague considered themselves to be children and didn’t want to be fathers … and they especially didn’t want to be fathers to the following generation – they had no connection with them, they didn’t help them” (20). This generation – Assayas, Arnaud Desplechin, André Téchiné, Benoît Jacquot – chose Bergman and Truffaut as models instead, a move that is important not only for the approach to dramatic representation that it entails, but for the fact of choosing – and wanting – a “father” figure at all. Assayas’s comments position him and the whole post-Nouvelle Vague generation in a compelling and transformative relationship with Truffaut’s own concept of a “cinéma de papa”. The rebellion of this generation is to say – as Jones describes it – “I’ll bet on fiction and character, and against the constant interrogation of the image – a dead end” (20). 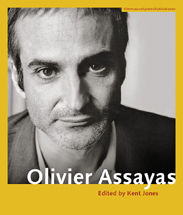 The book is anchored by Jones and his correspondence with Assayas over a period of two decades. The introductory essay – “Westaway to the World” – conveys the most information from these exchanges, but it is also palpable in the other three chapters authored by Jones – “Revival”, on L’Eau froide (1994), “Cosmic Pulses”, on Eldorado (2008), and “Lost Companions and Fleeing Ghosts”, on Après-Mai. Assayas’s voice is therefore highly audible throughout the collection, coming to a literal point of expression in the last section where he discusses ten influential films (including Bresson’s Le Diable Probablement , Debord’s We Turn in the Night, Consumed By Fire , Anger’s Invocation Of My Demon Brother  and Cronenberg’s Videodrome . The book’s approach to authorship is in this way wholly classical, foregrounding the perspective and priorities of the director as a site of meaning. This approach aligns with the critical framework set up by Jones for Assayas and his generation, where the question of representation is never allowed to overwhelm what is being represented. The individual chapters all take up this perspective in their own manner, attending to the dramatic, political and romantic ways that Assayas renders the contemporary world in narrative terms. Each chapter focuses on a single work, from Désordre (1986) through to Après-Mai, with a late chapter on short films that fell “early and in-between”. The sensibility that arises from the repeat identification of certain tropes and concerns works to effectively break down the perception that Assayas works in two registers – the low-key, dialogue-driven and often partially autobiographical realm of L’Eau froide, Fin août, début septembre (1998) and L’Heure d’été, and the dystopian and emotionally “anaesthetised” mode of the irreal, global thrillers Demonlover (2002) and Boarding Gate (2007). It is typical in writing on Assayas to find this latter mode linked to a sense of flux and movement that is understood to express global experience. I am among commentators who have argued that a key achievement of these two films – as well as Clean (2004) – is to render the recognisable contemporary world virtual by rapid movement between countries and cities, and fast and mobile camerawork through the uniform spaces of transnational culture – airports, hotels, office buildings. Across the essays in Jones’s collection, though, Assayas’s concern with motion is shown to permeate all of his films. The lives of the adult characters revisiting their childhood home in L’Heure d’été are described in terms of a “relentless forward motion .. always taking us into the next thing, a different thing” (183). The movements and glances of the young, unwitting revolutionaries in Après-Mai are said to “tremble with an unspoken sense of something nameless, in the process of happening” (200); a precise illustration by Jones of the quality he describes in his introductory essay as “the speed of life” – a sense of personal agency shared between characters about how one measures up against other people and the world. In the essay on Carlos (2010), a case for Assayas’s agency as a director who deliberately provokes this sensation is made clearest when his work process is described as one where “discovery trumps intent”, where there is no rehearsal before shooting, and a shuffling of perspectives arises naturally. Assayas’s own conception of this process is described in another exchange with Jones, where he reveals his belief that one’s objective should be to “go on to the set and create chaos. Some kind of chaos. So that people lose their reference points and just use their brains, and don’t just go through the motions” (34). The Assayas perspective that some critics want to call melodramatic or romantic is here framed in terms of the Debordian situation, where the creative act of depicting reality is morally held to correspond with everyday life. Many of the chapters comment on the central place that music holds in the Assayasian situation, none more expansively than Chris Chang’s chapter on Noise (2006), which details the true complexity of bringing music and musicians to cinema in a way that utterly rejects the cool, corporate logic of “music supervision”. Setting images to music – and music to images – is here an organic process driven by the logic of what will “take”, in the sense of an organ transplant. While these essays are all lyrical and erudite in the individual stories they sketch on the separate films, Olivier Assayas is most persuasive as a whole: a dynamic pattern of unapologetically personal accounts that make palpable the unique urgency of this complex and intricate body of work.